Consumer Product Safety Commission (CPSC) and Wagner Spray Tech Corp., of Plymouth, Minnesota announce the recall of the Wagner cordless drill charger base. Hazard: A defective battery can cause the charger base to overheat, causing the base to melt and possibly burn nearby objects. 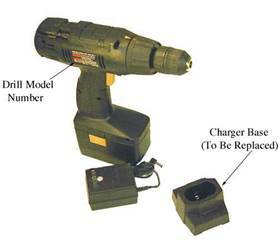 Description: This recall includes 9.6-volt, 10.8-volt, 12-volt, 14.4- volt and 18-volt Wagner drill charger bases. The drills were sold in black and grey, and have the name “Wagner” printed on them. Model numbers involved in the recall are: W96DK, W108DK, W120DK, WB96, WB120, WB144, and WB180K. The model numbers are located on a label on the side of the drill. Remedy: Stop using the charger base and contact Wagner Spray Tech for information on receiving a replacement charger base. Consumer Product Safety Commission (CPSC) and Lasko Products Inc., of West Chester, Pennsylvania. Hazard: The power cord connection can overheat and cause the cord to separate from the space heater. This poses a fire, burn and shock hazard. Incidents/Injuries: Four consumers reported burned and detached power cords. No injuries reported. Description: There are two types of heaters involved in this recall. 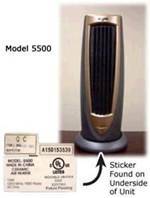 The recalled model 5500 heater is an oscillating ceramic heater with dark grey vents surrounded by a bronze trim. The model number is located on a label under the round base. The Model 5700 heater is an oil filled radiator-type heater. The model number is located on a label on the side of the heater near the right front wheel. The name “Lasko” is printed near the top of both heaters. Manufactured in: Model 5500 – China; Model 5700 – Portugal. Remedy: Consumers should stop using the heaters, unplug them and contact Lasko Products for instructions on returning the heater to receive a free replacement heater or a product of similar value. Consumer Contact: Consumers can call Lasko Products toll-free at (800) 233-6373 anytime or visit the firm’s Web site at www.laskoproducts.com/recall_heaters.html for more information and to determine if their heater is involved in the recall.